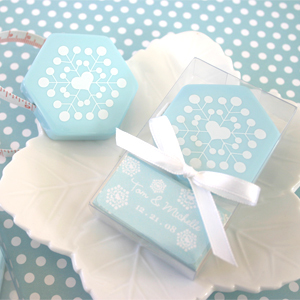 Winter snowflake tape measures are great for winter wedding favors. This winter, have guests "measure up some love" with these sweet little snowflake tape measures. This handy little favor will tie into your winter wedding theme and serve as a useful keepsake for your guests. These creative ice blue colored "snowflakes" come neatly packaged in a clear box and finished with a white satin bow. Labeled with a special message "Happy Holidays". Price is per winter snowflake tape measure. Minimum order is 12.